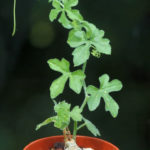 Kedrostis africana is a caudiciform plant with lots and lots of herbaceous climbing or creeping vines, growing rapidly from the swollen base and looking like an English Ivy with a tuber. The caudex is large, up to 20 inches (50 cm) in diameter, simple or branched, woody and stone-like of variable shape. The vines are annual, up to 20 feet (6 m) long, thin, green glabrous or nearly so. 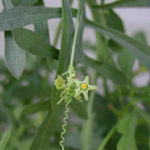 The leaves are alternate, green, up to 4 inches (10 cm) long, triangular in outline and more or less deeply palmately divided into 3 or 5 lobes. 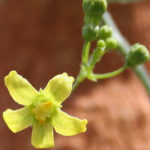 The male flowers are green-yellow to whitish or cream, 1 to 12 in short racemes on up to 3.2 inches (8 cm) long peduncle. 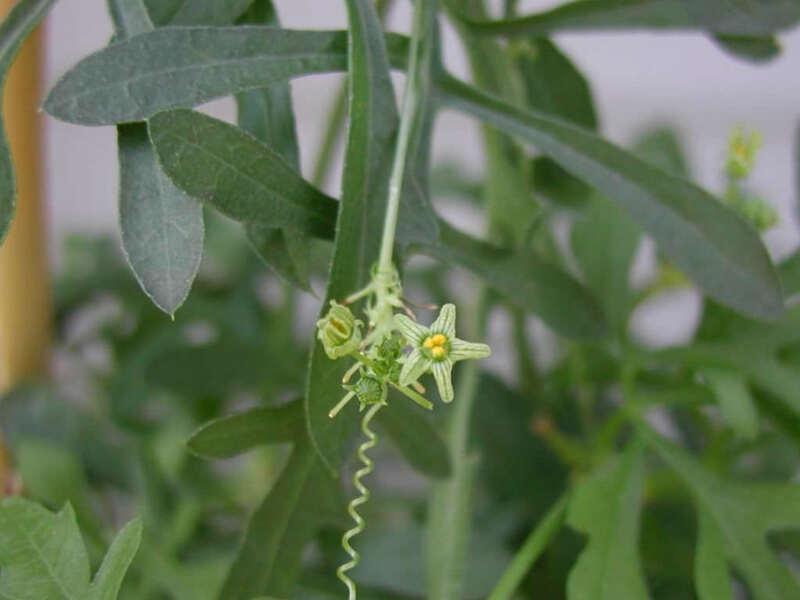 The female flowers are solitary or few in fascicles, green-yellow to whitish or cream. 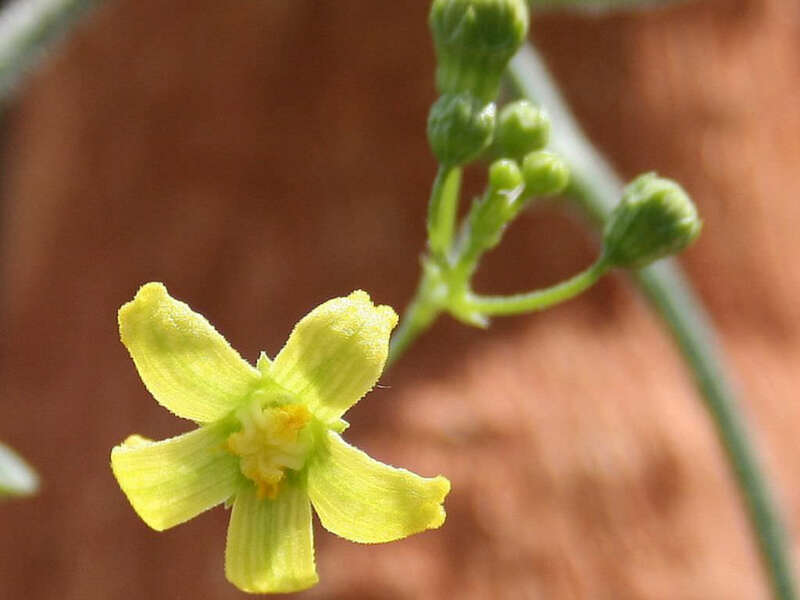 Baboon’s Cucumber is monoecious (with separate male and female flowers but on the same plant) and is often self-fertile so the showy, orange fruits are readily formed. It can be grown from seed in most areas, as long as the young plants are protected against drought, severe frost and too much sunlight. As a climber, the stems will need some support to give a showy effect. Baboon’s Cucumber prefers well-drained soil, lots of water in the growing-period and some sun. 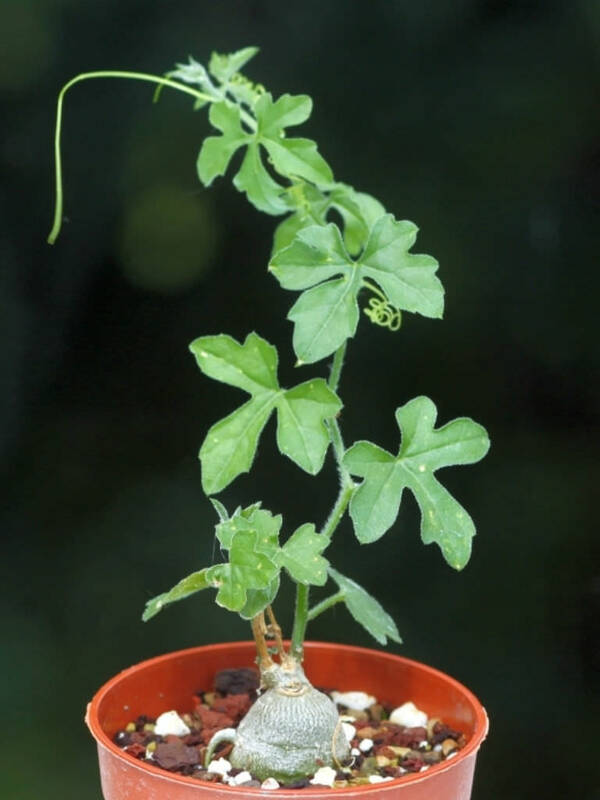 It grows very slow, but it possible to increase the speed of growth by providing adequate amount of water, warmth and fertilizer during the active growing season. Baboon’s Cucumber likes a sunny position, but avoid direct blasting sun in summer. Water regularly during the summer. 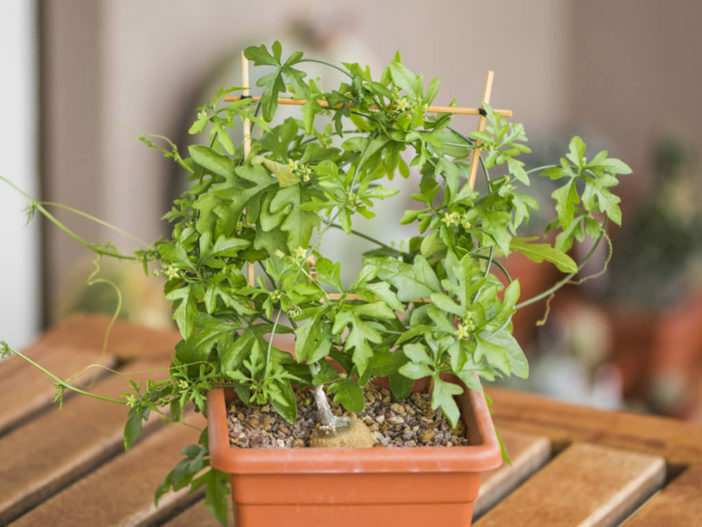 Avoid watering in the fall or winter. It is susceptible to rot if too wet. Kedrostis africana is native to Namibia and South Africa.